Photo for Pokemon Diamond Pearl Action Figures DP2 is uploaded and added note on movable parts . One of my eBay customers asked me, do you know this shoes ? Bandai will out 17 figures of Pokemon Kids series "Encore 4" on 26 May. "Encore" have been started since 2006. Encore 3 was released last December. Pokemon battle action figure Regigigas will be introduced by Tomy on 17 April 24 April. Size is approx. 9.8" height, having many gimmicks. So far Torterra, Infernape, Empoleon, Dialga, Palkia, Rayquaza and Lucario have been released. Giratina will come in July. 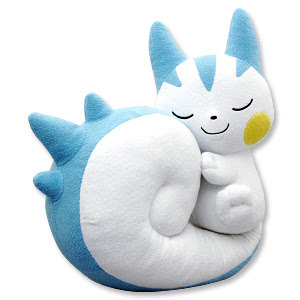 New Pokemon plush of Pichirisu is introduced by Pokemon Fan Club in April. Pokemon Movie site in Japan has announced Shaymin as 492nd Pokemon officially. In Pokemon new 11th movie (Giratina and Sky Bouquet), Shaymin is being one of main Pokemon. On the other hand, Tomy will out Shaymin DS Lite silicon cover in April, refer to games store play-asia.com. This is the first product of Shaymin on a commercial basis. Photo for Pokemon Clipping Figures Part3 is uploaded. Stands of Uxie, Mesprit and Azelf can be joined. Photo for Pokemon Figure Release Info in April (Tomy MC) is uploaded. Giratina is "another" form in this time. Sunglobal releases Pikachu transceiver on 15 February. So far the transceiver of Hello Kitty, Sargento Keroro, Doraemon and Rilakkuma have been released. 2 pcs set in the box, size: 7cm, Communication range: appx. 30m, battery: Button battery LR44 x 6 (for testing use), with neck strap. 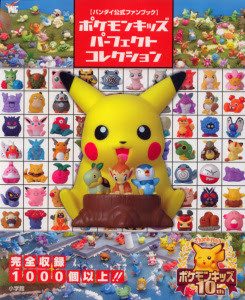 This book covers all of Bandai Pokemon Kids figure since 1996 to 2006 (upto 10th anniversary special box set). Includes Pokemon kids, Attack series, DX series, color defence version, limited promotion figures, photo of figure back side. Published in December 2006, sold out immediately, re-published recently. Language in Japanese, photo mainly in the page, size is 25 x 21 cm, 100 pages. For all Pokekids fans, it's a super reference ! Subarudo will release 3 figures of Pokemon Pose DP series part 3 in the middle of February. Size is 3", arms and legs are movable, candy toys. Bandai Pokemon Kids Attack 08, a photos (March release figures) is uploaded. 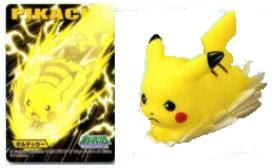 Particularly , here is Pikachu "Volt Tackle". 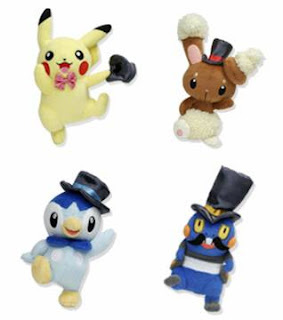 New Pokemon plushes of Pikachu, Piplup, Buneary and Croagunk are introduced by Pokemon Center on 9 February, size is approx. 5.5" height, "Pokemon Contest" version. 4 New Pokemon plushes, Horsea, Bellossom, Tropius, Piplup and Pachirisu will be introduced by Banpresto in the middle of February. Size is approx. 5.5-6" height, game prizes. Bandai will release 12 figures of Pokemon Clipping series in the end of March. Size is 1.9"-2.7", these are candy toys, pose is natual and clipping from actual scene. Part 1 was released in April. Part 2 was in November. Stands of Uxie, Mesprit and Azelf can be joined. Bandai will release Pokemon Diamond Pearl action figurus DP2 in the end of March. These figures are Gashapon (capsule toy). 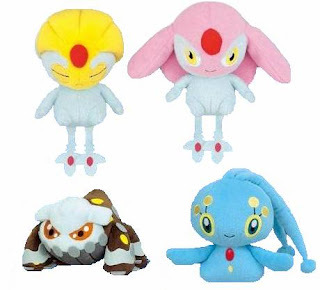 As for DP1 (First set), refer to Pokemon Diamond Pearl 6 Action Figures. Photo for Bandai Pokemon Super Get Series 14, figure release in February is uploaded.